This medication is used to treat symptoms of dry mouth due to a certain immune disease (Sjogren's syndrome). Cevimeline belongs to a class of drugs known as cholinergic agonists. It works by stimulating certain nerves to increase the amount of saliva you produce, making it easier and more comfortable to speak and swallow. What conditions does Cevimeline HCL treat? List Cevimeline HCL side effects by likelihood and severity. Before taking cevimeline, tell your doctor or pharmacist if you are allergic to it; or if you have any other allergies. This product may contain inactive ingredients, which can cause allergic reactions or other problems. Talk to your pharmacist for more details. This drug may make you dizzy or cause vision problems, especially at night. Alcohol or marijuana can make you more dizzy. Do not drive, use machinery, or do anything that needs alertness or clear vision, especially at night, until you can do it safely. Limit alcoholic beverages. Talk to your doctor if you are using marijuana. What should I know regarding pregnancy, nursing and administering Cevimeline HCL to children or the elderly? Other medications can affect the removal of cevimeline from your body, which may affect how cevimeline works. Examples include cimetidine, amiodarone, ritonavir, fluoxetine, among others. Does Cevimeline HCL interact with other medications? If someone has overdosed and has serious symptoms such as passing out or trouble breathing, call 911. Otherwise, call a poison control center right away. US residents can call their local poison control center at 1-800-222-1222. Canada residents can call a provincial poison control center. Symptoms of overdose may include: extreme sweating, shakiness, slowed/irregular heartbeat, severe breathing problems, confusion, fainting, stomach/abdominal cramping. 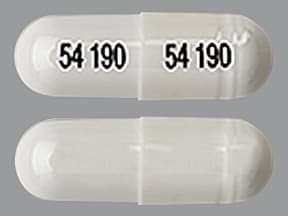 This medicine is a white, oblong, capsule imprinted with "54 190" and "54 190". 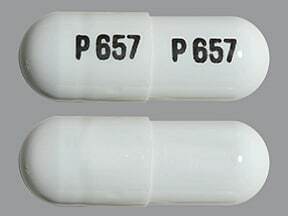 This medicine is a white, oblong, capsule imprinted with "P 657" and "P 657". 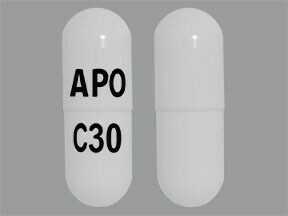 This medicine is a white, oblong, capsule imprinted with "APO" and "C30". 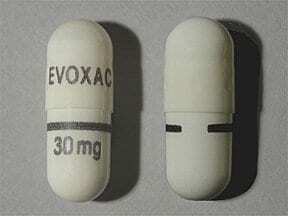 This medicine is a white, oblong, capsule imprinted with "EVOXAC" and "30mg". Are you taking Cevimeline HCL? Are you considering switching to Cevimeline HCL? How long have you been taking Cevimeline HCL?